The son of two of Belfast's leading Irish republican families, Sinn Fein leader Gerry Adams claims he never joined the Irish Republican Army. Most informed commentators think he is a liar. 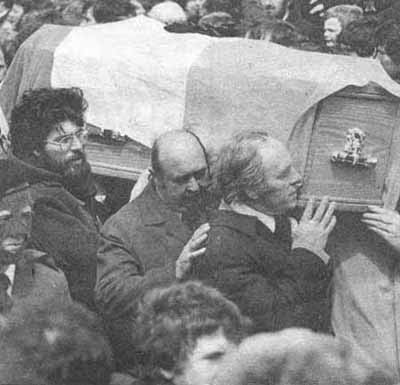 In January 1973, Adams was photographed at the funeral of IRA man Francis Liggett dressed in the IRA's black beret marching alongside the coffin with other IRA members. In 2002, Marion Price, convicted for being part of a bomb team that attacked London in March 1973, said in public that Gerry Adams was "my commanding officer" at that time. In early 1977, Adams went to the home of a Belfast journalist who lived near Turf Lodge and worked for the BBC Spotlight program. He presented himself as representing the Belfast Brigade of the Provisional IRA. 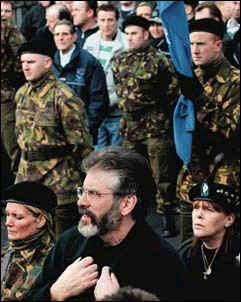 He was arrested after the La Mon Restaurant Bombing in February 1978 and was charged with IRA membership. Adams denied the membership charge, threatened to sue reporters who repeated the charge, and applied for bail. The case went to court but the charges were dismissed. Many senior Republicans at that time were surprised by Adams's denial of membership, for they had usually taken the approach of offering no comment to such a charge. In this fashion, they offered no information and did not contribute to speculation (see for example pp. 265-66 in Ruairí Ó Brádaigh, The Life and Politics of an Irish Revolutionary}. 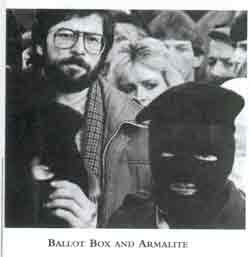 In 1980, an undercover Special Branch officer followed Adams across the border during an investigation into an IRA counterfeiting operation. Sean O'Callaghan, a former IRA member, Garda and MI5 informer from County Kerry, has claimed he spoke to Adams at IRA meetings in the 1980s. He states that Adams was a battalion quarter-master responsible for weapons, then the age of 22 Adams became Officer Commanding of the Second Battalion, Belfast Brigade IRA. On 20 February 2005, Irish Minister for Justice Michael McDowell publicly named Adams as a member of the seven-man ruling IRA army council during a radio interview. According to the British government, he has been a member for over 20 years, although he has never been convicted of IRA membership and continues to deny it. In July, McDowell said that, according to senior police sources, three Sinn Féin leaders, including Adams, had stepped down from the IRA command in a prelude to a peace move. Adams denied the report. "We can't stand down from a body of which we were not members", he said. In Memoirs of a Revolutionary, the autobiography of Seán Mac Stíofáin, Provisional IRA Chief of Staff during 1969-72, Adams is described as commander of the Belfast Brigade (albeit only in the caption of a photograph). You should also note that Adams and the Irish Republican Army received training and arms from Communist Cuba and the Soviet blocs. The IRA and the PLO openly supported each other as well. money to support the IRA in its political/criminal activities was openly collected on the streets of New York. The one thing you dont do in America is slag off the Irish. "money to support the IRA in its political/criminal activities was openly collected on the streets of New York. So linking a place of Ground Zero to the Irish Republican Army a known terror group? How "mature" of someone like you. There are Irish everywhere. You think every Irish American embraces the likes of the horrible IRA? MAH Dirk's just making an observation, not indicating support for terrorism. Its well known that the Irish revolution is funded largely from the US. The socialist nature of the revolution is played down by Irish fundraisers in the US, so as not to alienate donors. "Its well known that the Irish revolution is funded largely from the US." I do not think that's where the IRA received their training from. Their tactics are more similar to that of the PLO, but I do not see people looking for pro-socialist/pro-Communist elements within the U.S. government that are promoting the "peace process" in Northern Ireland. Such organs are the Council on Foreign Relations to which I believe one of its high-ranking members was involved with the "peace process". The "peace process" with the IRA kind of reminds me of what's going on with the PLO being "moderates" but the likes of Ban Ki-moon visited the grave site of Yasser Arafat, along with Condi Rice calling Mahmoud Abbas a "moderate". Gery Adams is a lying oportunistic apologist for murder,and one of the reasons why the troubles have rumbled on for so long.The IRA have been collecting money for murder from gullible,sentimental Americans for more than eighty years. Big deal! it is a commonly known fact that most ambitious and successful terrorists make it to political respectability. Among many others: Sharon in Israel, Mandela in SA; the FLN in Algeria, the Maoists in Nepal and soon Hamas will visit the White House. If Bin Laden had a home country he would already be a respected statesman. Terrorism pays! Just another path to democracy. K5XpRW The best blog you have! 6b8S9e Please write anything else!